JurongHealth Services (JurongHealth) is one of the six public healthcare clusters under the Ministry of Health Holding (MoHH) in Singapore. JurongHealth manages an integrated healthcare hub, comprising the 700-bed Ng Teng Fong General Hospital,the 400-bed Jurong Community Hospital and the Jurong Medical Centre. The two hospitals were designed and built together from the ground-up as an integrated development to transform the way healthcare is provided to the community. Ng Teng Fong General Hospital obtained the coveted HIMSS EMRAM Stage 6 certification for its use of technology within 3 months of opening in June 2015 and achieved Stage 7 – the highest EMRAM level – in Sep 2016, a year after opening. OpenGov sat down with Mr. Lim Soo Tong, CIO of JurongHealth to learn about the journey till date. Mr. Lim tells us how ICT was a part of the plans and designs from the earliest stages. He also talks about the future, with the focus shifting from ‘healthcare’ to ‘health’ as part of the Singapore government’s plans for a Regional Health System (RHS). 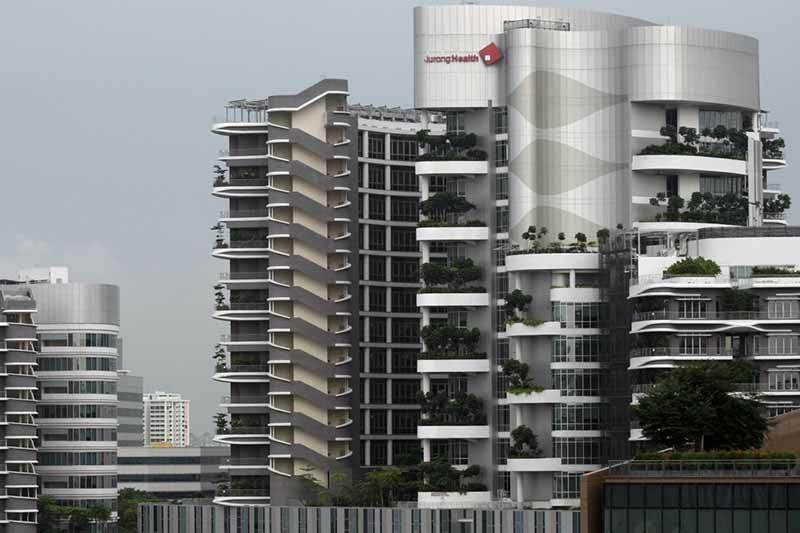 JurongHealth cluster was formed in 2009 to build and operate the 2 hospitals together with Jurong Medical Centre. JurongHealth took over the operation of the existing Alexandra hospital while concurrently launched the plan to build the new facilities. Operating and managing Alexandra hospital enabled the organisation and its people to learn and gain relevant hands-on experience running a full-fledged operating hospital and be ready to run the new hospitals. Once the new hospitals were ready, Alexandra Hospital was handed back to the MOHH and now it is run by SengKang Health as part of the Singapore Health Services cluster. Concurrently, while the buildings were being planned, we started architecting the overall IT solution. In IT speak, we call it the Enterprise Architecture – this is the IT blueprint much like the architectural blue print for the physical building. To have a sense of the IT solutions for the hospitals, we talked to all the stakeholders – planners, management, doctors, nurses, administrators, etc – to get a understand what they had in mind for the new hospitals. Those inputs were absolutely essential. We had to ensure that when the new hospitals were built, it would be digitally connected from day one. For that, we had to design the network architecture, the running andlaying of structured and fibre cables, the placement and coverage of wireless access points. Once we had that done, we moved to system architecture, where we consider the IT systems we needed to run the hospitals. Thankfully, with the wealth of experience in building and operating IT systems in public hospitals, we were able to leverage on solution standards and existing systems that were in used in other hospitals. Still, we have to cater for new processes and operational requirements. It had to be there because if you build and run a new hospital exactly like an old one, then it wouldn’t be a new hospital. Since we had the opportunity to build 2 integrated hospitals from the ground-up, we wanted to make sure that the hospitals are equipped to meet the digital challenge. In doing so, we ensured that the whole facilities are wired up and connected digitally. We installed adequate Wi-Fi access points to provide 100% coverage of the hospital grounds. It was important to have IT design as an integral part of the hospital building from the earliest possible stage. We relied on the schematic building diagrams to decide on the exact locations of the wireless access points to get full Wi-Fi coverage in all the areas in and around the buildings. You have to get it right the first time as any rework after the building is up will be cumbersome and costly. What is really challengingwas going to each floor and figuring out what we need right down to each bed. We have planned to put a a patient information board at each bedside, not a physical computer but a connection to a computer system that can provide the information that the doctors and nurses need when they see the patient, such as patient’s name, the assigned doctor, any drug allergies, language spoken, dietary requirements and other information that helps in the delivery of safe care. In most hospitals, this was manually compiled. Every time a new patient come in, a nurse would have to compile and transcribe all that information for display at the bedside. It was tedious, time-consuming and there was the possibility of transcription errors creeping in. At JurongHealth, we are the first public hospitalto put in a computerised patient information board (PIB) at each bedside. We installed digital tablets at each bedside and pumped the relevant information into the them from the Patient Information Management System. If the patient is transferred from Intensive Care ward to General ward, the information follows saving the need to recompile and rehash the data. To improve the care delivery process, we also utilised RFID tags to track patients. So, we don’t even need to tell the system that the patient has been transferred. Once the reader detects that the patient has arrived at the new ward, the correct information will be displayed automatically at the PIB. All this planning was done at the early stage when users’ requirements are gathered. If a system is built in isolation by the IT people without consultation withthe users, then you can be sure that adoption will be very low. During the early planning stages, we visited renowed hospitals in the US, South Korea, Japan and Thailand to learn from the best. It paid off as we were able to adopt and adapt good features in our hospitals where it made sense. Once the buildings were sufficiently built up and it was safe to get into the building, we put on personal protection equipment such as hard hats and safety boots and went inside the incomplete building frequently to see the actual physical layout for ourselves. Before that, we could only work with mock-ups of the wards etc. We were able to make sure that things were exactly like what we had planned for. We checked the smallest of details. The TOP (Temporary Occupation Permit) for the building was obtained in September 2014. With this milestone, the rush of activities began. Everything from beds to desks to dustbins to computers were being brought in a frenzy pace. We went around checking for defects, making sure that everything worked from electrical power points to LAN points and get them ready for commisionning. How did you deal with training users? We started on-site dress rehearsals soon as it was physically safe for us to do so. You can do as many table-top exercises as you like, but nothing beats doing it on site, with actual people doing the actual thing. We even had staff to volunteer as patients. From a system perspective also, we had to pay special attention to user training. We had two new hospitals with a quite a few new systems and new processes. To complicate matters, we had a lot of new staff that came on board. so we had to carefully plan and coordinate the training so that users were trained at the appropriate time – cannot be too early, else they will forget, nor too late as they need to be able to use the systems when the hospitals open. So, we had new hospitals, new staff, new processes and new systems all at the same time!! We developed extensive training programs to ensure all staff were appropriately and adequately trained. We adopted the train-the-trainer approach. We identified a core group of people and trained them and relied on them to train the rest of the users. We went through a series of technical walk-throughs supplemented with integrated workflow trainings and then table-top exercises followed by dress rehearsals cumulating in full-dress rehearsals.. The key challenge was testing the systems in an integrated manner together with the workflows and processes. We cannot test all these in isolation. The latter is easy. We conducted massive amount of integration tests, going through many rounds, many iterations. Systems also had to be integrated with the common, shared systems across all the healthcare clusters and also government agencies. Everything had to work on day one, when the hospital opened. The dress rehearsals culminated in two full dress rehearsals. You could do rehearsals just pertaining to your area of work. Each department might do its work perfectly well in silo. But if you don’t test how everything is going to work when brought together, you stand the risk of missing some steps or connection. And if that happened on the actual day of opening, everything could collapse. The full dress rehearsal ensures that everything works together harmoniously as intended to be. We ran through testing using real-life scenarios, or what we call use cases, where a patient comes in and gett through all the various touchpoints before leaving the hospitals. We did this a few times, until everyone was satisfied that they knew exactly what to do. Can you tell us about the opening of the hospital and the progress from there on? We opened the doors of the Ng Teng Fong General Hospital on 30th June, 2015. The great thing was that it was a non-event on the opening day. It meant that we had done our job really well. Everything ran more or less as it was supposed to. We learned a lot over the course of our journey and in the process, won some prestigious awards such as the Project Management Institute’s (PMI) Project of the Year Award and the HIMSS Elsevier Award, recognising our effort and achievements. It’s been 16 months now since we opened the hospitals and operations have stabilised. We are now ramping up business activities and so far have successfully kept up with the increased in volume of business. What are the plans and areas of focus for the future? We are preparing for further expansion, adding more rooms, more clinics. My responsibility as the CIO is to ensure that when business expands and volumes grow, the IT infrastructure can take on the additional load and pressure. If you look at the longer term, 3-5 years ahead, we have to align with public healthcare IT strategies and guided by the national Health IT Master Plan (HITMAP) to achieve Singapore’s Healthcare 2020 vision of accessible, quality and affordable care for our population. What we are concentrating on is the rollout of the ‘Regional Health System’ (RHS). The emphasis is not just on healthcare anymore. It is on ‘health’. Healthcare is caring for people when they are sick. Health is the state of a person’s physical well-being. If you are healthy, you don’t need to come to the hospital. RHS aims to keep the populace out of the hospital to the maximum extent possible, for as long as we can. For example, we want to do health screenings pro-actively, before you are hit by something serious. It is all about population health, which is an approach that aims to improve the health of the entire population. What role would IT play in the RHS? There are specific systems that we can use to engage the population on health. Imagine doing health screenings for the entire community and providing the necessary follow up care. You are no longer just catering to patients’ requirements. You are now looking after health of the population before they become patients. The IT systems need to be able to do that and a feedback loop into our existing systems. The challenge is dealing with the broadening of coverage and generation of massive volumes of data. It will be an extension of the mainstream medical record system and has to be connected. Looking after a person’s health is no longer a single organisation’s responsibility. Hospitals, polyclinics, GPs, nursing homes, Voluntary Welfare Organisations all come into play – hence the Regional Health System. And the more information we have on you, the better we can look after you and attempt to keep you healthy. The challenge is how to bring all these pieces of data together. We need to extend the National Electronic Health Record (NEHR) to capture health records of non-patients. We need to get all the data in from the connected sources – screening systems, GPs and even private hospitals. Big data analytics has a vital role of equipping care providers with better knowledge for better decision making, so that they can provide value care. We have started working on all this already and we will get all the pieces of the jigsaw in place.